Wilde has worked with WFEL, a world leader in tactical military bridges, for a number of years, with engineer Greg Roney on permanent secondment since 1996. Other specialists from within the Wilde team are drafted in to WFEL as their business needs dictate. WFEL has supplied 39 armed forces across the world for over four decades.Greg Rooney is responsible for all technical aspects of the organisation’s products including modular bridging, such as the Medium Girder Bridge, Dry Support Bridge and other special products. 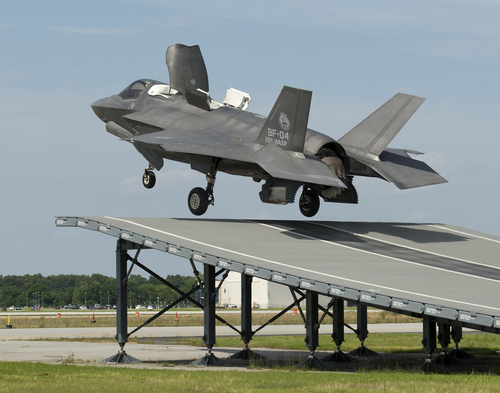 WFEL were invited to design a demountable structure for use during the testing of the Short Take Off variant of the Joint Strike Fighter – F35B. A two man team was employed to work alongside the designers to provide technical support. Needs were met through structural analysis involving extensive finite element modelling, using both static and dynamic techniques. Greg and his colleague, Shakeel Chaudry, produced models and performed analysis to ensure the structures integrity under the worst loading conditions; from both the aircraft and the environment. This design work was initially presented through extensive reporting, subsequently followed by a full design review at the US Naval Airbase where the structure will be located. The review also addressed the proposed manufacturing methodology and a costing exercise, prior to developing a budgetary quote for production of all parts. WFEL successfully won the bid and were awarded the contract to manufacture the Ski Jump. Greg was heavily involved with the structural testing of all major components, writing of the test specifications, undertaking the tests and report writing. Once all of the components were manufactured and individually tested, the complete structure was erected. Once built, the structure was loaded in many positions representing snapshot locations along and across the flight deck. The testing successfully demonstrated that the structure is capable of withstanding all loads generated by the aircraft. The customer (JSF Integrated Test Force) visited from the States to witness first hand the building and testing of their new hardware. The components were erected by a US contractor, with Greg representing WFEL on site to provide technical support during the build process. The first scheduled flight from the Ski Jump took place on 19 June 2015, executed by a Joint Strike Fighter, F35B variant, with tail number BF-04 and Peter Wilson as pilot. “We have been very happy with the way the project has been run and all time milestones have been achieved throughout the process”.